Macaroni, bacon, honeycomb, Idaho potatoes; all the may sound like the menu of a smorgasbord, but it’s not. 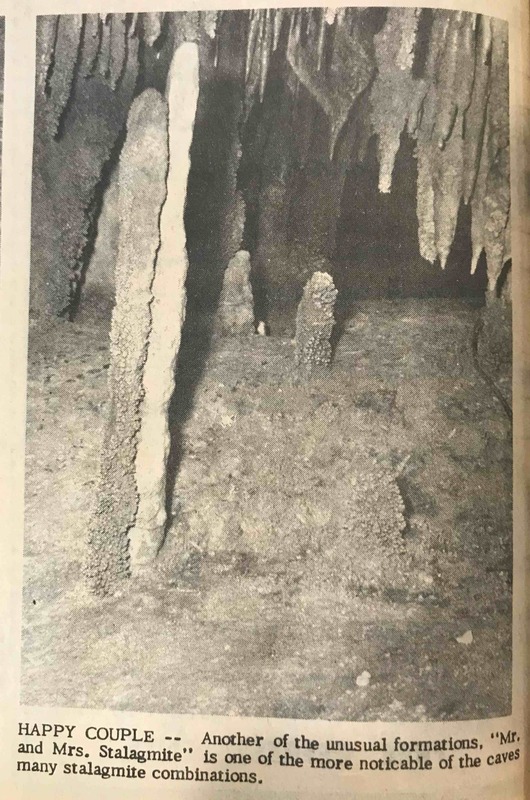 They are the names of some of the rock formations of the Caveland’s later addition to the many and beautiful caverns in the area: Crystal Onyx Cave. 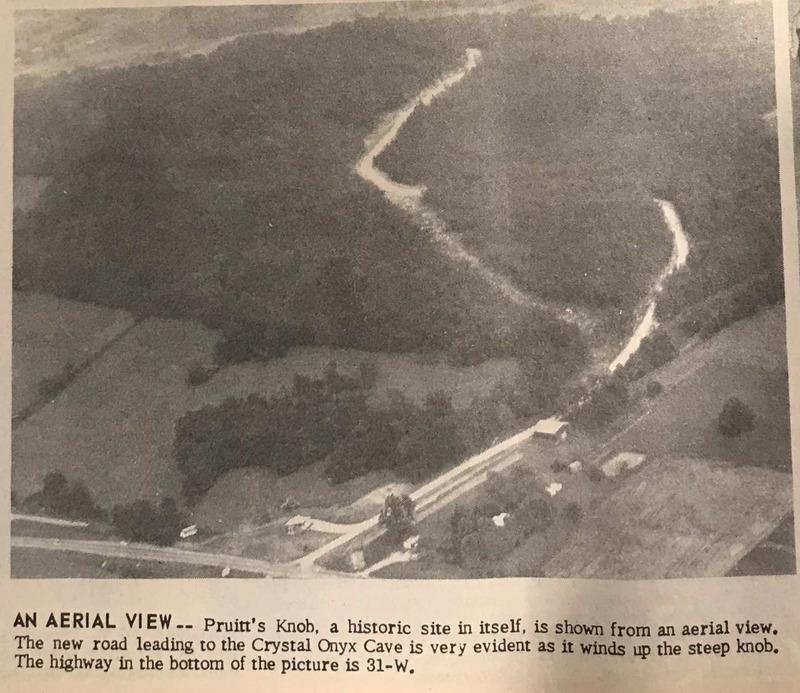 The new cave, which has an ideal location on Pruitt’s Knob just off Highway 31-W near Cave City, will be open to all area people who want to view the natural beauty of the cave starting this Saturday at 8 a.m. However, the Grand Opening will not take place until the next Wednesday at the same time. Then, the faxcxilibties of the cave, which features a gift shoppe and restaurant atop the caverns, will open, and the cave will officially start business. 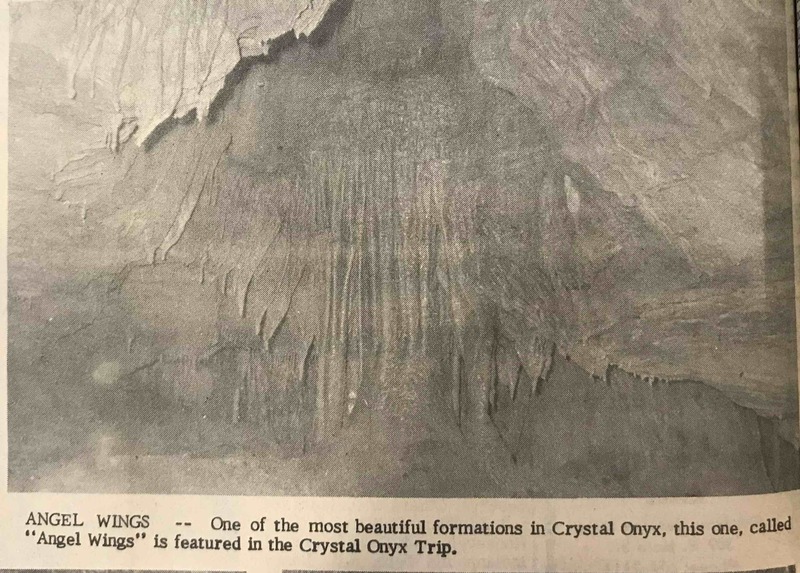 Crystal Onyx was discovered in 1960 by Cleon Turner, an area man who haws been spelunking for over 30 years. 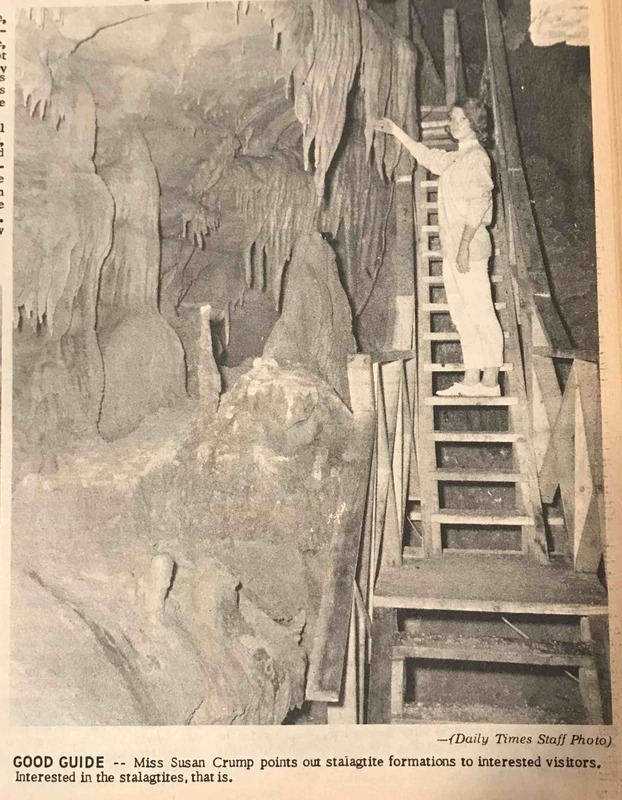 Mr. Turner now serves as head guide at the Cave since its opening. Shortly after its discovery, Turner took reporters from this newspaper through the cave. 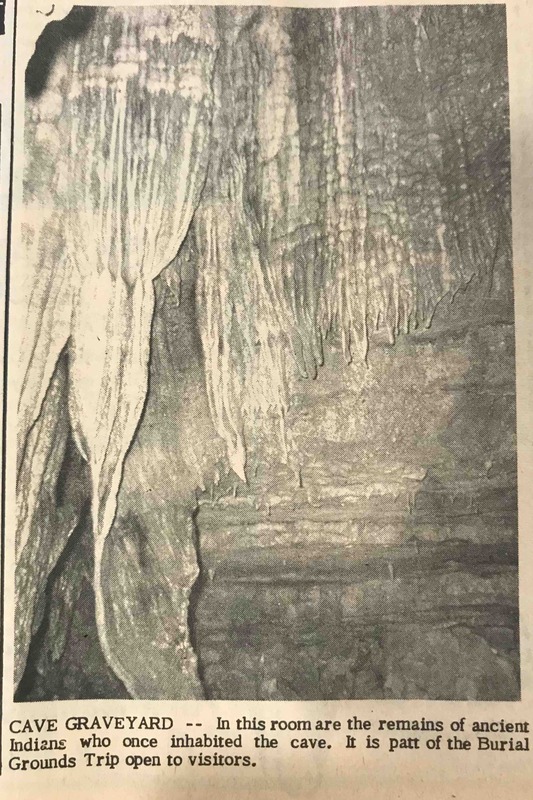 Although this tour eventually resulted in an excellent article, the journalists found themselves in for a rough tine, for, at the time, the 80 foot drop had to be descended by ropes tied around the chests of the visitor. Harrowing tales are still being told about the first trip. 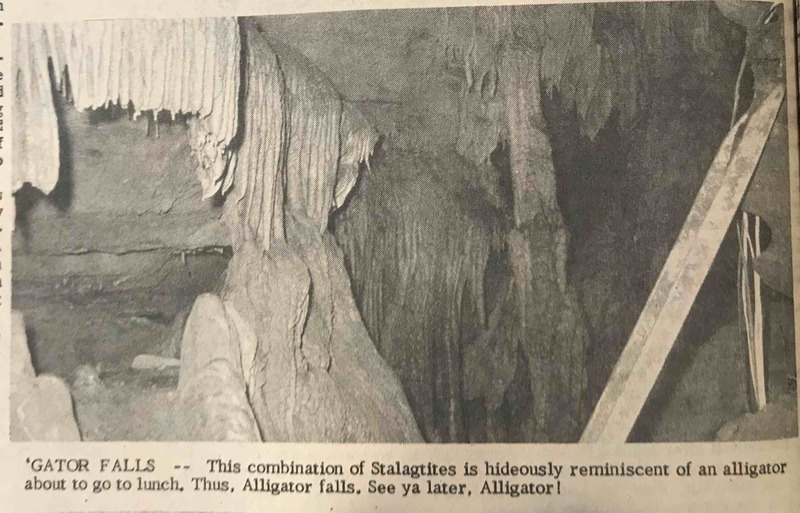 A recent visit to Crystal Onyx Cave proved quite different, however. 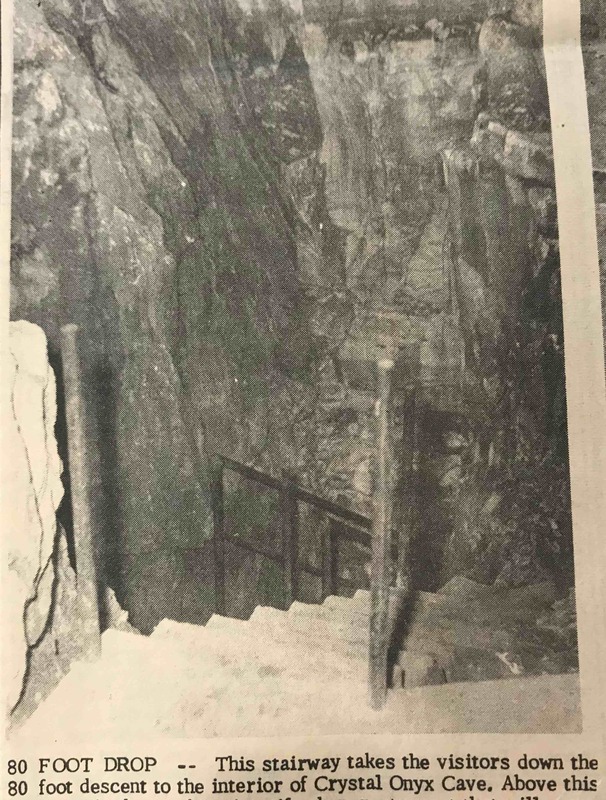 Sturdy cement and wooden staircases have replaced ropes as means of cave transportation, and modern electric lighting sets off the beauty of the many formations. All concerned with the new tourist attraction were in a state of busy activity as they prepared everything for Wednesday’s’ Grand Opening. 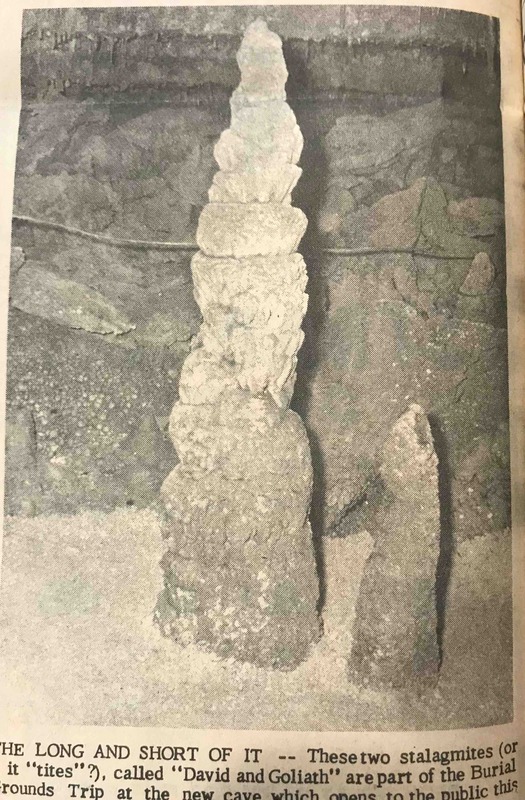 Carpenters hammered noisily on the roof of the sift shoppe-restaurant, men in blue coverall scurried through the cave making the final adjustments on the lighting, dump trucks poured gravel on the road connecting the cave with the highway, and everywhere was the feeling of something about to come to readiness. A guided tour of the caverns shows why it should be a very interesting and accessible tourist attraction for this area. A large sign points the way from the main road to the cave, which is about 7/’10 of a mile back from 31-W, and the view from the road looking down on the farmland of the county is almost worth the trip in itself. Once at the cave, the visitor may take any one of four trips. The Lake trip features an interesting underground lake, the Moon Room, which has a cratered roof somewhat resembling the surface of our moon, and Honeycomb Gardens where unusual rock formations are in abundance. The Scenic Trip is given over more to the rock formations, stalactites, and stalagmites which fill the cave, and some of the names are almost as unusual as the formations themselves. Witness: the Hanging Gardens, the Giant Star Fish, Cascade Falls, Macaroni Room, and the Travertine dams. If the visitor is more historically oriented, he may be interested in the Burial Grounds Trip. Here, he can see bones of early Indians who once inhabited the cave. Also on the agenda for thi8s tour is the Bacon Room, the Angel Wings, Mr. and Mrs. Stalagmite, and Crystal Onyx Falls. Hearty types may enjoy the Crystal Onyx Trip, which is a tour of the entire cave. Trips range from 45 minutes to three hours in length and are available every 30 minutes. Sunday best is not recommended for a tour through the caverns for the going can get a little tight at times, however, if visitor don’t want to risk a little smudge they can also see the other interesting sights at the cave area, such ad the remarkable views of the surrounding countryside, the nature trails, or the Indian burial mounds. Crystal Onyx Cave has great possibilities for becoming one of the best tourist attraction in this area Exciting and close at hand, it will make a very interesting trip for the whole family when it opens this Saturday.